We’re currently just a few days out from the greatest company in all of mixed martial arts returning to our screens. 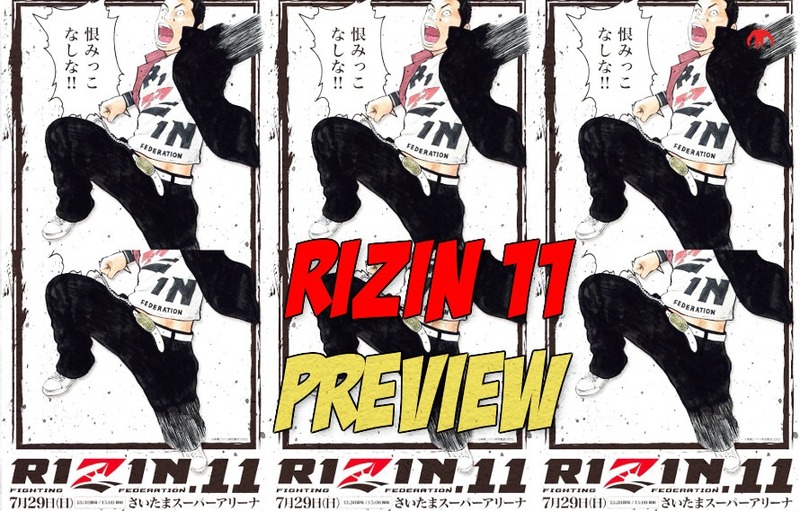 On July 29th Rizin 11 takes place in the home of Japanese martial arts; the Saitama Arena. In the main event the local hero Kyoji “The Gooch” Horiguchi will be rematching against fellow Japanese fighter Hiromasa Ogikubo. The pair battled with each other way back in 2013 and Kyoji secured a submission via choke in the 2nd round. Since the losing to “The Gooch” Hiromasa has won 11 of his 12 fights with his only loss coming from TUF winner Tim Elliott. Hiromasa tends to win most of his fights on the scorecards by out wrestling his opponents. As for Kyoji he boasts a (24-2) professional record with his only loss coming from arguably the greatest of all time; Demetrious Johnson. Kyoji has become something of a finishing machine since signing to Rizin and has managed to finish five of his last six Rizin fights. Will Hiromasa be another statistic on Kyojis hit list or will he find a way to out wrestle and submit Kyoji ? We will find out July 29th at Rizin 11. Also further down the card is another rematch, this one is between Kanna Asakura; the sister of popular Rizin bantamweight Kai Asakura, and Rena Kubota who is something of a Japanese Conor McGregor. The pair fought each other back on the new years eve grand prix card and Asakura (A heavy underdog) pulled off the unthinkable upset over the fan favorite Rena Kubota and submitted her in the first round. The fight thrusted Asakura into stardom and within the chaos of new found stardom she managed to successfully defend her atomweight belt at Rizin 10 against Canada’s Melissa Karagianis and won an easy decision. It’s a rematch that has many fight fans buzzing with excitement. If you navigate to the co-main event you’ll find a hidden gem of a fight that hasn’t really garnered any mainstream attention; Jiri Prochazka (20-3-1) will be battling Bruno Cappelozza (10-4). Both athletes compete in the light heavyweight division and pack earth shaking knockout power. This fight is nearly guaranteed to not go the distance and it’s a fight in which you’ll not want to blink in fear of missing out on the nuclear strikes. Two other compelling match ups on the card are Daron Cruickshank VS Tom Santos. Daron Cruickshank has become something of a poster boy for Japanese martial arts; he is promoted similar to that of Pride era Dan Henderson, he employs a wrestle-box style which he uses to try and grind out his opponents on the ground or at times he attempts to crack his opponents on the feet with an overhand right. Since leaving the UFC for Rizin Cruickshank has went (4-2) with none of his fights heading to the judges’ scorecards. Cruickshanks future dance partner is Tom Santos; a Brazilian prospect who is explosive in the beginning rounds and likes to put a volatile pace and speed on his opponents. It’s a compelling fight as Cruickshank could take down Santos and tire him early or they could swing and have a frenetic fast paced war in the early rounds. The final unmissable fight at Rizin 11 is a lightweight showcase between “The Fireball Kid” Takanori Gomi & Melvin Guillard. Gomi’s last outing was against rising prospect Yusuke Yachi at the Rizin 2017 Grand Prix, he lost the fight via submission even though he did show some streaks of the vintage “Fireball Kid” Gomi we fell in love with back in Pride. His opponent will be Melvin Guillard, who is on a seven-fight losing streak but has faced some quality opposition; for example, he lost in a middleweight contest to Israel Adesanya last July. The fight really should have happened ten years ago but it’s still something fun to add to the already stacked card, so why not?